Is geoengineering the key to solving the global climate change problem? That’s the kind of question that evokes a knee-jerk reaction from those how consider it, including me. I believe we’re already doing enough geoengineering on the planet, albeit unplanned and perhaps unintended. For me, geoengineering like the kind environmental engineer David Keith speaks of in the TED Talk video below, is a fool’s errand. Keith, who has done extensive research into geoengineering, doesn’t necessarily disagree. But he does caution that to make an informed and morally justified decision about whether to employ it or not requires a more nuanced approach in how we think about it. Even if Keith believes geoengineering is possible, he makes it clear where he stands on its value. “And I guess my view on this is not that I want to do it – I do not. But that we should move it out of the shadows and talk about it seriously, because sooner or later we’ll be confronted with decisions about this and it’s better if we think hard about it even if we want to think hard about reasons why we should never do it. So as emissions continue to accelerate in their rate of increase, we just increase in tandem the amount of geoengineering. Keith goes on to explain in this scenario that humanity does come around, not just “tapping” on the brakes, but we pushing hard to slow CO2 emissions, starting now. This leads to what economists call a “moral hazard,” Keith says. Keith therefore suggests an aggressive and comprehensive research program of geoengineering is vital. Not necessarily to promote the idea, but to fully understand it, though Keith expresses his doubt in getting past the moral hazard problem. 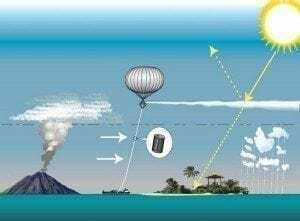 In the end, the more we take seriously the idea of geoengineering and try to understand it, even if to determine why it is such a bad idea, the better off we will be in the face of a changing climate. It sure beats a knee-jerk reaction.